Congratulations to the winners. Pictured front row left to right: Addalyn Nelson and Gavin Burnham. Back row left to right: Simon Carignan, Owner Canadian Tire (Wawa), Constable Levi Brousseau (SE OPP) and Nick Vorlicek (Algoma Power Inc.). Safe Communities and Algoma Power Inc. in partnership with the Ontario Provincial Police (OPP), Sault Ste Marie Police Service (SSMPS), Anishinabek Police Service, and Batchewana Police Service, searched throughout the summer for kids “playing safe” in the Algoma District. Through this program, youth were encouraged to develop positive safety habits by wearing the proper protective equipment while enjoying outdoor activities such as riding their bicycles, rollerblading, skateboarding and general outdoor activities. Police officers on patrol were on the lookout for children playing safely and obeying all the safety rules. An officer presented the children in the Wawa area with a certificate and also a coupon courtesy of Algoma Office Equipment that could be redeemed for an ice cream treat, courtesy of Young’s General Store in Wawa. 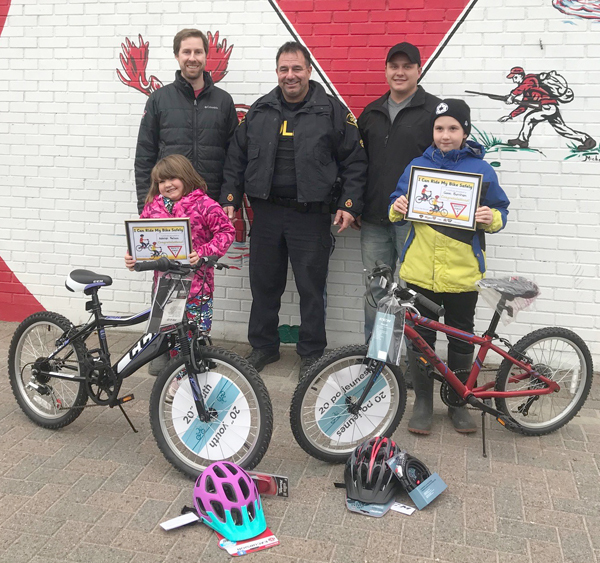 Youth were able to drop off their ballot at this location for a chance to win a new bicycle donated by Algoma Power Inc., and a helmet donated by Canadian Tire. The winners were presented with their bike and new helmet at Canadian Tire on Tuesday, October 30th, 2018. The Play Safe Program thanks everyone who participated in staying safe this summer, and encourage them to keep it up! A big Thank-you to all of our sponsors: Ontario Provincial Police (OPP), Young’s General Store, Algoma Office Equipment, Algoma Power Inc., Canadian Tire and the Safe Communities Partnership.